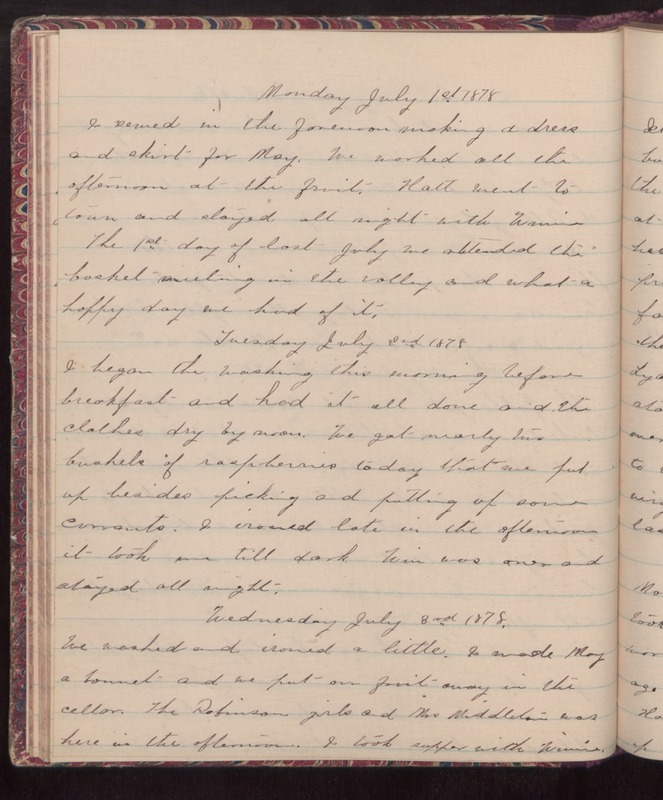 Monday July 1st 1878 I sewed in the forenoon making a dress and skirt for May. We worked all the afternoon at the fruit. Hatt went to town and stayed all night with Winnie. The 1st day of last July we attended the basket meeting in the valley and what a happy day we had of it. Tuesday July 2nd 1878 I began the washing this morning before breakfast and had it all done and the clothes dry by noon. We got nearly two bushels of raspberries today that we put up besides picking and putting of some currants. I ironed late in the afternoon it took me till dark. Wind was over and stayed all night. Wednesday July 3rd 1878 We washed and ironed a little. I made May a bonnet and we put our fruit away in the cellar. The Robinson girls and Mrs Middleton was here in the afternoon. I took supper with Winnie.